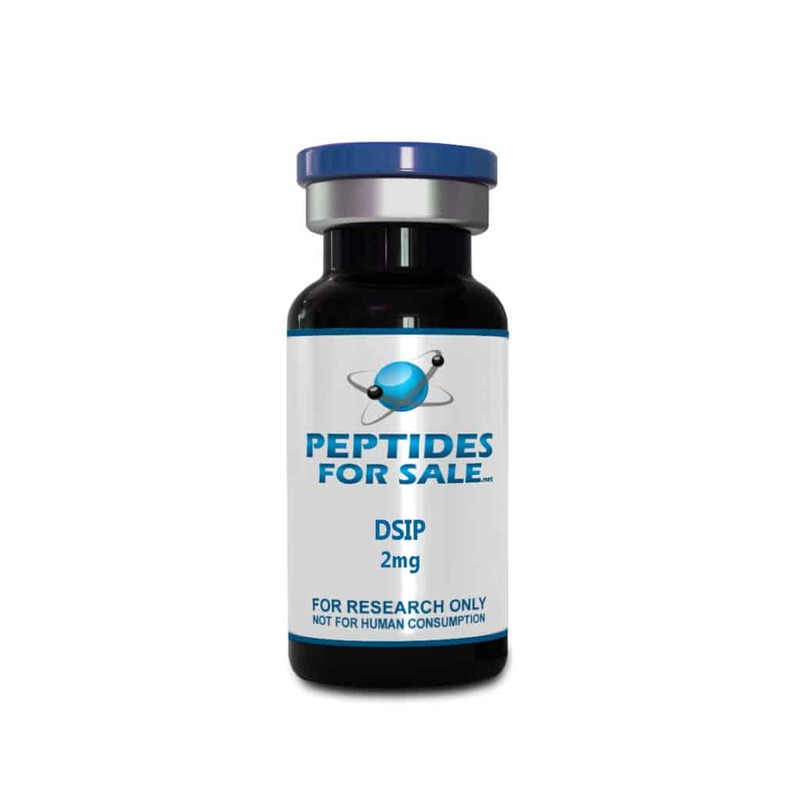 Buy DSIP 2mg at Peptides for Sale. For the best quality peptides and research chemicals, Peptides for Sale has what you need. DSIP, or Delta Sleep-inducing peptide, is a neuropeptide that little is known about its gene. When DSIP is injected into the Mesodiencephalic ventricle of recipient rabbits, it decreases motor activities along with inducing Delta EEG activity, as well as a spindle. In terms of its Amino acid sequence, DSIP has a sequence of trp-ala-Gly-Gly-Asp-Ala-Ser-Gly-Glu. The discovery of DSIP came in the mid-1970s when the Swiss Schoenenberger-Monnier group isolated the peptide from the cerebral venous blood of rabbits during when the rabbits were in an induced state of sleep. In terms of its Amino acid sequence, DSIP has a sequence of trp-ala-Gly-Gly-Asp-Ala-Ser-Gly-Glu. It has a molecular weight of 850 Daltons. DSIP has been found in various parts of the human body including, Limbic system, the hypothalamus in both free and bound forms, Pituitary gland, and in other organs, fluids and tissues. In the Pancreas and gut secretory cells, DSIP is found in massive amounts, and in the places mentioned above, it co-localizes with glucagon. Also, it also co-localizes with several other peptide’s mediators and non-peptide mediators in the Pituitary Gland. Some of these mediators include; Melanin-concentrating hormone (MCH), Corticotropin-like intermediate peptide (CLIP), thyroid-stimulating hormone (TSH), and adrenocorticotrophic hormone (ACTH). NMDA receptors act as DSIP mediators in the brain. A study showed that DSIP via NMDA receptors could stimulate Acetyltransferase activity. Under the controlled condition, DSIP was found to exhibit low molecular stability. Furthermore, under the action of an aminopeptidase-like enzyme, it only had a half-life of just 15 minutes. On the other hand, in a living body, the half-life greatly improves due to the fact that DSIP complexes with the carrier and also due to the fact it forms a part of a significant precursor. Till date, there no gene has been identified for this precursor. Several types of research have revealed that a DSIP with more molecular stability has tremendous roles to play in the body. Exhibits geroprotective effects, as discovered by the same study as above, DSIP reduced the age-related switching off of oestrous function. The mice tested showed a 24.1% increase in maximum lifespan more than the controlled group and they also exhibited a 22.6 % decrease in the number of chromosome aberrations in the bone marrow cells of the mice. The peptide can be a potential treatment for epilepsy. DSIP acted as an anticonvulsant to decrease the duration of fits in a study carried out on rats suffering from Metaphit-induced epilepsy. Can DSIP be the next anesthesia? In one such study, rather than decrease the heart rate and increase the depth of anesthesia, DSIP did the opposite when administered to Humans. Utilized in the correction of Central system function in children after antiblastomic therapy. A study showed that DSIP reduced chemotherapy-induced impairment in the bioelectrical activity of 90% of kids ages 4-16 years old. Another study targeted opiod and alcohol dependency. 87% of alcohol-dependent patients and 97% of opiate-dependent patients showed significantly reduced dependency after the administration of this peptide.